Do you say ‘God bless you’ instinctively when someone sneezes? Has it become an integral part of yourself? If yes, you will think twice before doing it the next time after reading this. According to a common misconception, we say ‘God bless you’ when a person sneezes because his or her heart stops beating for a moment. However this is not at all true. In the 6th century, when plague was ravaging Europe, a person who would sneeze would be considered to have the deadly plague and would die soon. 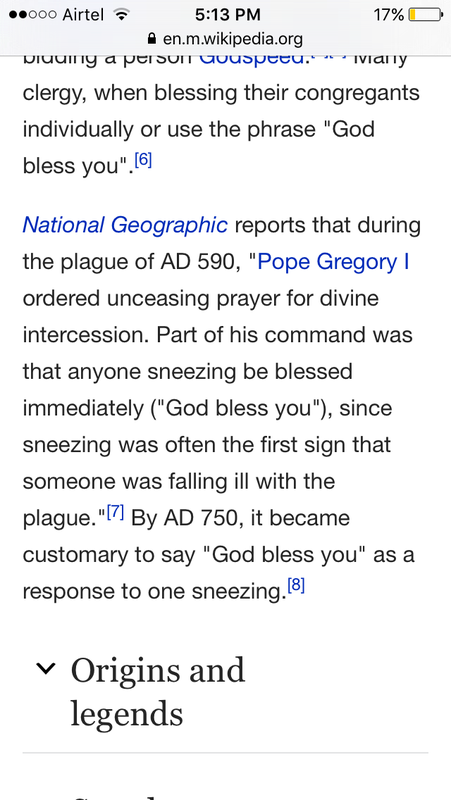 Therefore, the then Pope Gregory I ordered his followers to say ‘God bless you ‘ whenever they saw a person sneezing, because he or she was going to die soon and needed their blessings and good wishes. Since then it became customary. Many people today, not knowing the true story still follow the custom. I’ve added a screenshot from the Wikipedia page about the custom. (For those who want proof). This is an attempt to awaken the masses who have made it a habit of saying ‘God bless you ‘ without knowing the meaning.